Synonyms: Vitamin B7, vitamin H, coenzyme R.
Biotin is a popular supplement for promoting hair growth and nail growth. It’s a key ingredient in hair products ranging from encapsulated formulas to topical solutions such as shampoos. Other marketed benefits include the promotion of energy production and metabolism support. Although not commonly referred to as a B vitamin, biotin is technically vitamin B7. Due to biotin’s low effective dosages ranging from 2500 mcg to 10000 mcg, these amounts are too small to conveniently measure in a powder format. To counter this, mannitol is mixed with biotin to achieve a 1% biotin mix. This biotin is blended with 99% mannitol. 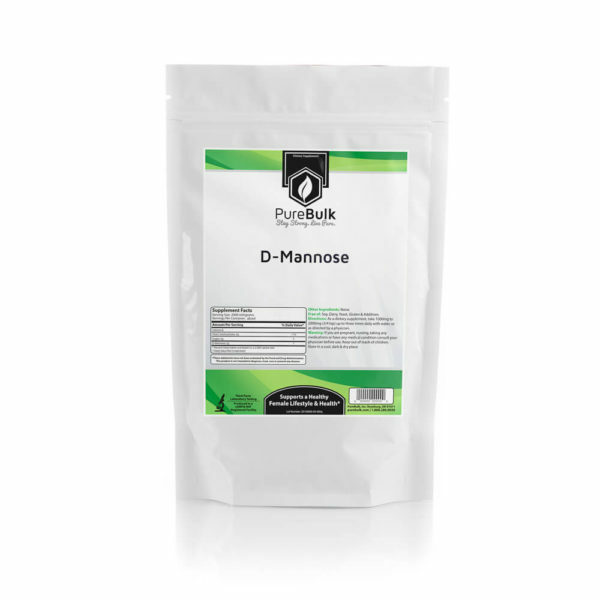 This is a common ingredient used to buffer powders with low effective dosages in order to provide convenience and safety. For the capsule format, this conversion equates to 5000 mcg of 100% biotin per capsule. A study demonstrating nail health used 2500 mcg biotin dosages. This is equivalent to 250 mg of 1% biotin powder. For hair benefits, 5000 mcg or 10000 mcg is ideal. The biotin capsules contain 5000 mcg each. 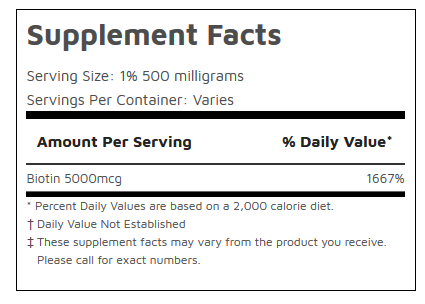 500mg of biotin 1% powder equates to 5000 mcg of biotin. This is roughly equivalent to a 3/16 tsp. 100 grams of biotin 1% powder has 200 servings equivalent to 5000 mcg of biotin. At $7.99 this is about $.04 per 5000 mcg serving. 120 capsules equivalent to 5000 mcg of biotin is $9.99. This equates to over $0.08 per serving. If cost per serving is important to you, then the powder is the winner. However, it’s less convenient than capsules. You can offset this inconvenience if you have a scoop that measures 3/16 tsp or don’t mind using a milligram scale.